LG will bring HDR to its 4K OLED TVs | What Hi-Fi? UHD, OLED and now HDR: LG adds another acronym to its TVs. LG is bringing HDR to its 4K OLED TVs. As first revealed by Forbes, and since confirmed in a statement to What Hi-Fi?, LG is planning a firmware upgrade for the LG EG960 series (or EG9600 in the US). HDR (High Dynamic Range) aims to deliver brighter whites and deeper blacks, as opposed to 4K/Ultra HD, which increases resolution. Users will be able to play HDR content from smart TV apps (e.g. Netflix, Amazon), or from other devices, through the TV’s IP interface. It is currently unclear whether this firmware will be compatible with HDR from upcoming UHD Blu-ray players, which will connect via HDMI. A release date for the firmware update is to be confirmed, as LG is waiting for official HDR specifications to be finalised. Meanwhile, the UHD Alliance is currently working on reaching an agreement for an industry standard. The full statement from LG reads: "OLED TV technology is perfectly suited to display HDR content based on its ability to deliver perfect black levels and infinite contrast. 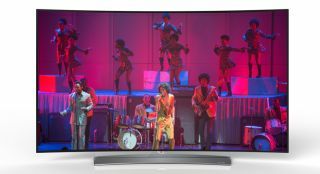 Once technical specifications for HDR are finalised, LG plans to provide a firmware upgrade for the LG EG9600 series which will support HDR content. This network update will enable consumers to enjoy HDR content streamed through LG’s Smart TV partner apps or delivered via other devices through the TV’s IP interface." You can read our full LG 55EG960V 4K OLED TV review online now.